There are two basic lines that automotive designers can ride while creating a new vehicle–one that is straight and one that is curved. 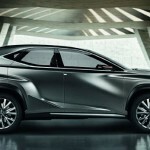 The Lexus team has taken the straight road to excess with the LF-NX Concept. 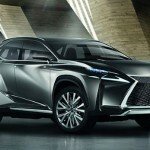 The new SUV design features a spindle shaped grille with diamond mesh, knife blade headlight bezels, boomerang-shaped taillights, and brushed metal bespoke wheel rims that resemble a kitchen sink grinder. 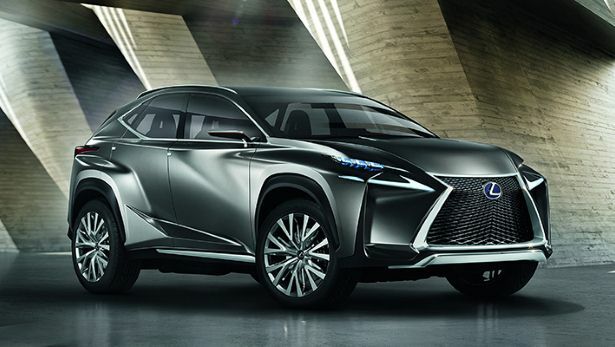 To add a little bling and machismo to the mix, the LF-NX gets splashed with a few chrome accents on the grille and lower panels, midnight black bumpers, air vents, and bulging fender arches. To soften some of the angles, the interior has been given a feminine touch in the form of sunrise yellow accents on the console, dash, and seat trim. 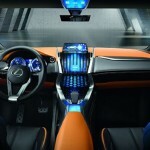 Bright blue instrument lighting highlights the gear shift, touchscreen, and door buttons. 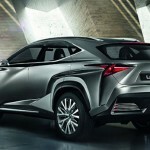 While you may be looking at what will be sold as a premier edition Lexus, don’t be fooled. Its DNA is from the proven, yet humble roots of a Toyota Rav 4. 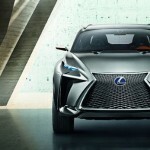 It will be powered by a hybrid 2.5-liter gas engine with electric motors, which is estimated to have somewhere around 200 horsepower without turbocharging. Mother may have told you not to play with sharp objects, but this one could be fun.